Before we could hit the road this morning, we had to find a way to pack all of our new Ikea furniture into the back of the minivan and still leave room for 3 kids, plus our luggage. Stephanie provided the idea to take out the middle seat, and Dad & I executed the plan. It worked great. Lucky for us, Mom & Dad were able to fit that middle seat into the back of the pickup and haul it back to Oklahoma for us. 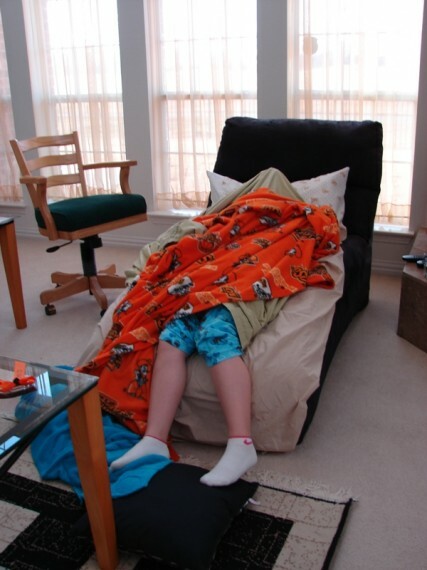 Mallory likes to sleep in the living room. 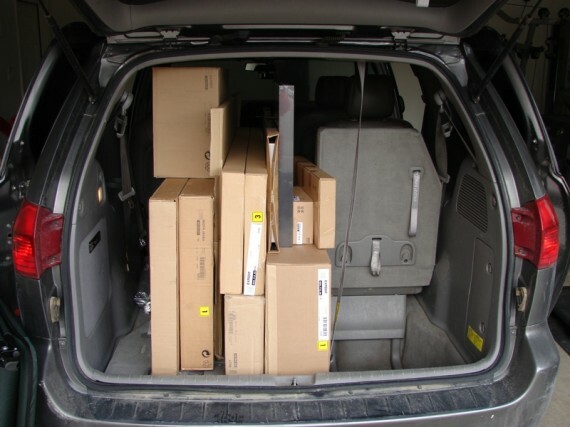 Minivan loaded with Ikea boxes. Joe & Judy hit the road first, and then Mom, Dad, Scott & Erin left a little after 10. We were not too far behind them. Our first stop of the day was the Ikea store (again). They had been out of a few items we were looking for on our first trip, so we thought we would try them again. Success! Not only did we find another bookcase, but we found a great floor lamp for $20 just by walking through the store, on the way to the bookcases. The next stop was at my cousin Beth’s house. They had found an Oklahoma State neon sign on sale at their local Lowe’s for $25. Apparently, there is not a big demand for OSU neon signs in Frisco, Texas. They picked it up for us, at our request, and we stopped by to pick it up. Unfortunately, they were not home, so they left it on their front porch. We narrowly missed out on an opportunity to see Beth, Rodney and Morgan for a 3rd time in 4 days. Earlier in the morning, we firmed up plans with Stephanie’s old college friend, Susan Sargeant. Steph and Susan were in the OSU band together their freshman year, and lived just 3 doors apart at the dorm. We met Susan and her family at Mooya Burger in Allen. We got to Allen a half hour before they did, so we spent a few minutes at the Allen Outlet Mall. I went into the Nike store and got a good deal on a jacket. There were many orange-clad OSU fans at the Nike store and around the mall. Miles and I even saw a boy his age that goes to church with us. We probably spent 90 minutes to two hours at the restaurant. It was great listening to Susan and Steph visit back and forth, catching each other up on what’s happening in our lives. Susan and Troy’s oldest child, Emily, is about 8 months older than Mallory. They hit it off well and visited most of the time, as well as played some games on Emily’s phone. Troy James, their son, is in 4th grade and demonstrated his mastery of Pong on his phone. One neat thing about the Sergeant family is that they do not have cable television. I am afraid that I have invested too much in my television just last week to commit to that. We pulled out of Allen about 3:00 and began our journey to Tulsa. 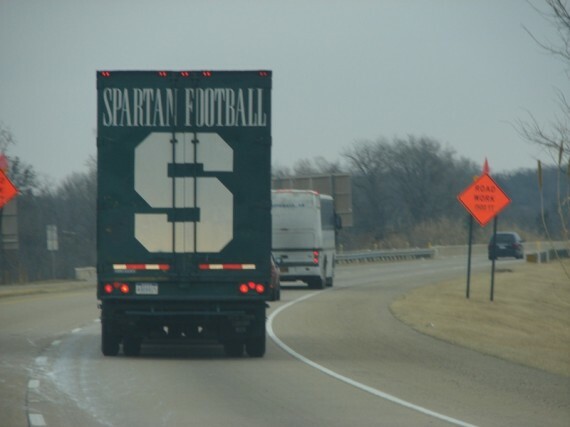 As we were near the Oklahoma state line, we passed the Michigan State equipment truck. Michigan State had played against Texas Tech in the Alamo Bowl, in San Antonio, last night. Steph and I both thought that the driver must have got a late start, likely due to enjoying a few too many margaritas on the Riverwalk after the game. Michigan State equipment truck on Hwy 75. 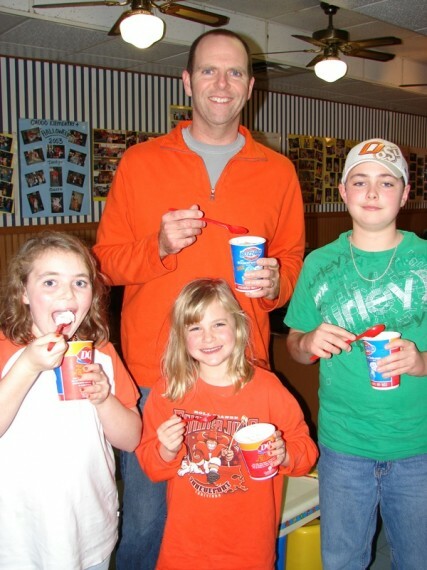 Our final stop on the journey was at the Dairy Queen in Caddo, Oklahoma. Any trip to Texas is not complete without a visit to Jack in the Box and to Dairy Queen (even if the DQ we stop at is in OK). Five Blizzards later, we were loaded back up in the car and on the road. 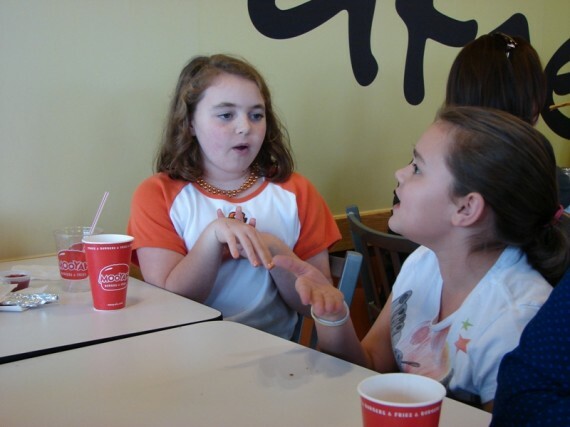 Enjoying treats at Dairy Queen. All three kids were enthralled with a movie on the way home. Mallory brought her portable DVD player that she won as a Girl Scout prize for selling cookies. The three of them were watching Toy Story 2. Normally, we have a rule against watching a movie in the car while it is light enough to look out the window. But… the route from Texas to Oklahoma is old hat – it’s not like we were driving past an ocean view or anything. Another great time on a family road trip. I could get used to this!